· Includes an audio instructional CD with 99 tracks! · 9″ x 12″, 64 pages, newly updated with coil binding! 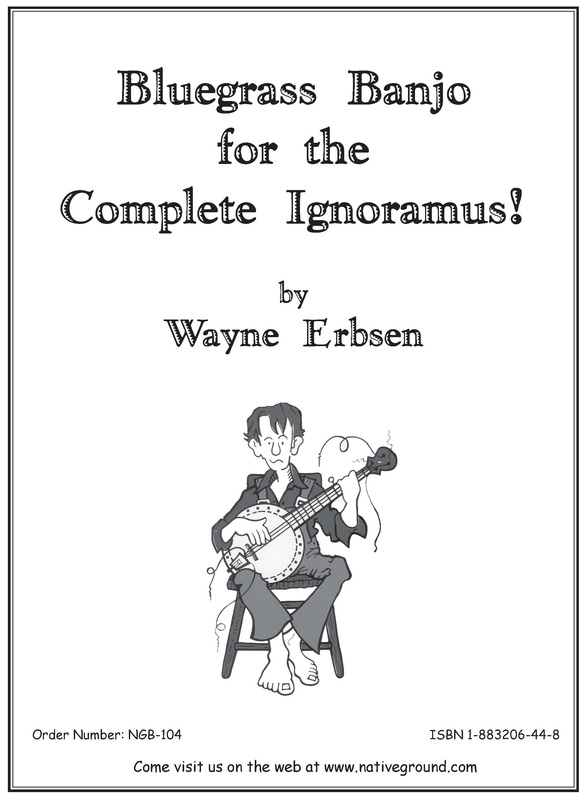 We’re proud to say that Bluegrass Banjo for the Complete Ignoramus! 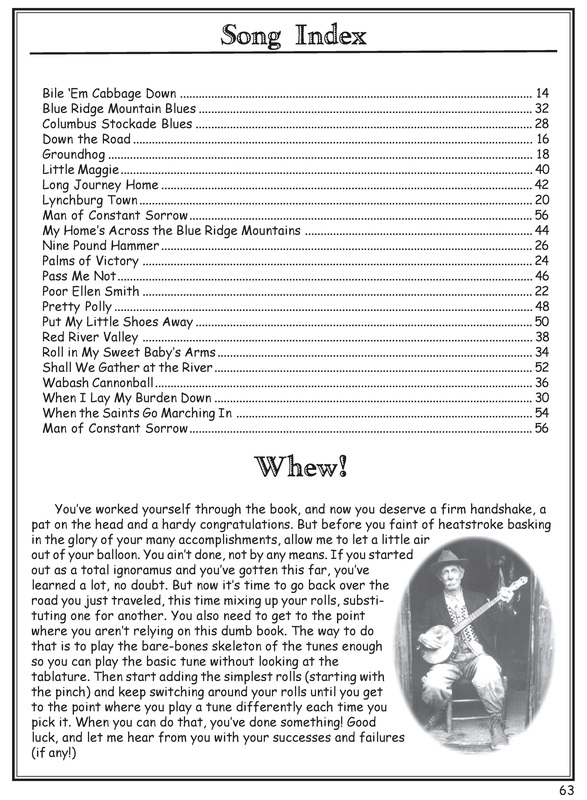 is one of the very best-selling banjo books in America. Still not convinced this is the book for you? Give Wayne a call at (828) 299-7031 and talk with Wayne personally! Best damn banjo book I’ve ever read! I have both Ignoramus books for banjo and another book from a different author and yours is by far the only one that has taught me how to play the banjo. I have had the banjo for 2 years before I bought your books and never had much luck in learning how to play until I purchased yours. Now I play every night. Thanks for helping us ignoramuses with the joy of making music. I wanted to let you know that the Bluegrass Ignoramus book is a work of pure genius. I’ve never had as much fun learning an instrument as I have with your book. 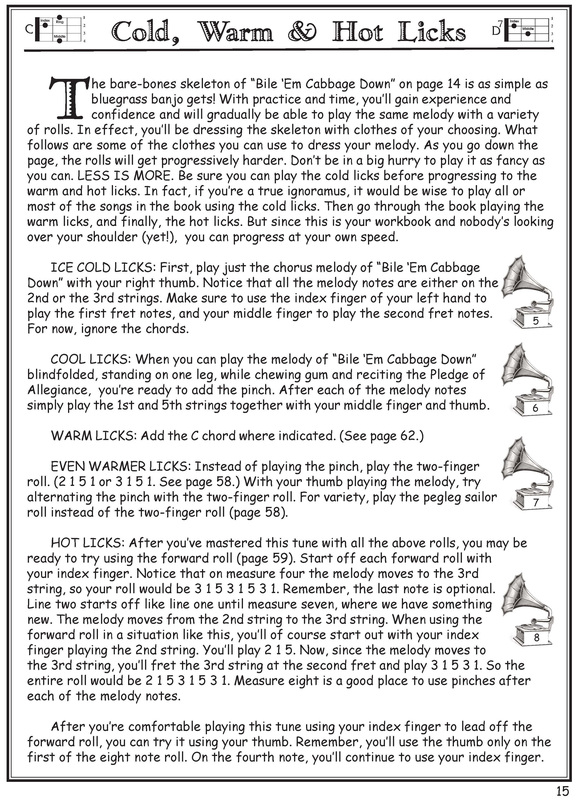 The “skeleton plus licks” is the perfect way to learn. The history of the songs is very interesting. Thanks for your work! I just wanted to say how much I’ve enjoyed Bluegrass Banjo for the Complete Ignoramus and now Clawhammer Banjo for the Complete Ignoramus. I’m not a complete ignoramus, but my wife thinks I have the potential to get there. With your books, I’m amazed how quickly I picked up the banjo. I love learning the songs and the history behind them. Thanks so much for helping me rediscover my love for the banjo. I would totally recommend your books to anyone. It really works. This book is absolutely fantastic…I really mean that. I had not played an instrument for 20 years (and never any strings), but with this book I have made substantial progress over the course of only a few weeks. Wayne breaks down the information so that any novice can pick up a Banjo and go. Plus, his hospitality and humor shine right through. My confidence is sky high with this book…I can’t put my Banjo (or this book) down! I am a musician of many years playing nine different instruments. Now, I look forward to a bluegrass world through Wayne’s book. I exchanged emails with Wayne today. He is incredibly courteous and an obvious expert in this field. I look forward to humble beginnings toward, perhaps, greater musicianship. Just starting playing the banjo and thanks to you it has been a very enjoyable experience your book explains everything completely and very easy to learn would highly recommend this book it is excellent I am getting better every day and truly enjoy playing my wife dissent even cover hear ears anymore! 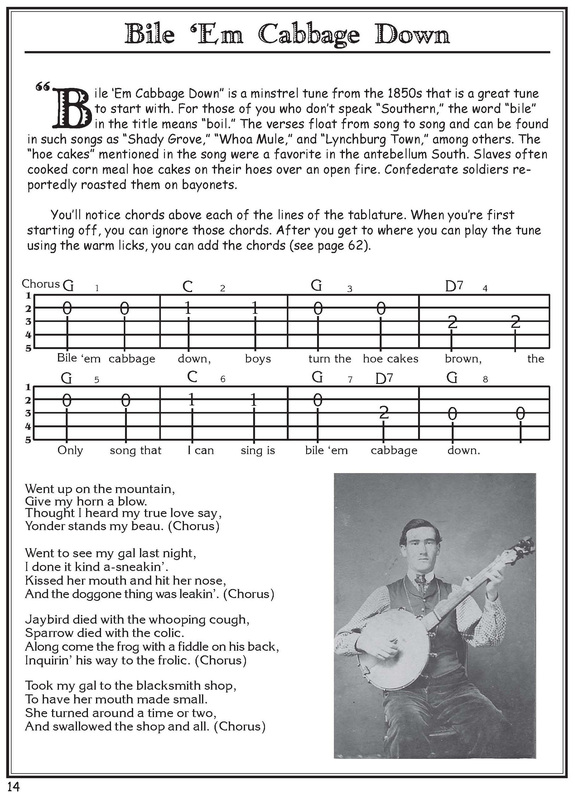 I just wanted to say that this book is by far one of the best ways to learn banjo. I can read tab, and have been playing on and off for 35 years now. I have joined a jam class and I am learning from my original banjo teacher from all those years ago. He wants me to close the book and play by ear, and could not grasp the idea till I got this book. The bare bones melody method is key to jamming. I have just ordered the Jamming book, and look to further my jamming skills between these two books and my old instructor. Thanks for a great product!! !